Everyone knows that Philips Hue is the leader in smart lighting, thanks largely to the fact that the company’s lighting products are fantastic. Of course, everyone also knows that Philips Hue lights are expensive — plus they only work if you buy a Philips Hue Bridge. If you’re looking for a lower-cost alternative, definitely check out the Eufy Lumos Smart Bulb. It’s always a very affordable alternative at just $18, but right now it’s on sale for just $12 and change. The Eufy Lumos works with both Amazon Alexa and with Google Assistant, and it also has an app where you can create scenes, timers, and more. Comfortable Lighting: Dim or brighten for your ideal illumination. Access From Anywhere: Whether you’re at home or away, control the lights from your smartphone or tablet with the free EufyHome app (Android 4.3 and above or iOS 8 and above devices required. 2.4GHz Wi-Fi network support only). Functional Lighting: Set schedules to automatically turn on and off and enable Away mode to simulate a non-vacant house while you’re out. 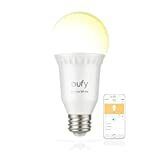 What You Get: Eufy Lumos Smart Bulb – White (Product Size: 2.56 x 2.56 x 5.5in), User Manual, Safety Instruction Card, Happy Card and our worry-free 18-month warranty.